This blog originally appeared in Ella Mag as part of my wine of the week series. LET’S SAY YOU want to cook a lasagne. In itself it’s a fairly big feat; layer upon layer of pasta, meat, sauce and other ingredients require careful attention in order show their best in the final product. But what to drink with it? And what kind of wine should go in it? Assuming this is going to be a rich, meaty lasagne with a savoury tomato sauce (as opposed to a creamy, vegetable-based version that might demand a white wine), not just any old bottle will suffice. This calls for something Italian. If the theory goes that a region’s cuisine developed hand-in-hand with its wine, we could then assume Italian food goes best with Italian wine. I know this rule is not always ironclad, but for the sake of fun, let’s just say it is. 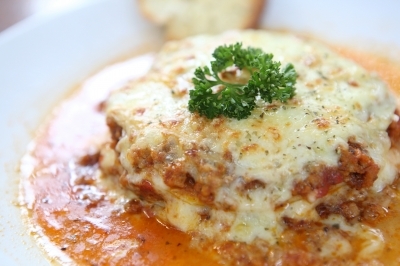 Any number of wines could be selected to go with a rich, meaty lasagne. Italy’s varied geography gives it some of the best vine-growing conditions in the world. It is because of this that viticulture and wine production exists in nearly every region running up from Sicily and Puglia all the way to the mountainous border region with Switzerland, thanks to steep slopes, sunshine and a temperate climate. For this week’s blog I have opted for two wines plus a wildcard. My two main recommendations are made from the barbera and sangiovese grapes: Barbera d’Asti and Chianti. I will reveal the wildcard in a moment. Barbera is mainly produced in the Piemonte region famous for Barolo and Barbaresco. It used to be that barbera was considered a ‘common’ grape and, as a result, it garnered little respect from wine drinkers. But these days it is Piemonte’s second-best grape after nebbiolo (which goes into Barolo and Barbaresco) and produces wines that are ready to drink at a younger age and have big, bold flavours that consumers seek. As a wine, barberas are rich with cherry and plum notes that go nicely with dishes that have strong flavours and seasonings. Chianti, meanwhile, is no stranger to most dinner tables and might be one of the most famous Italian wines. Produced in the region stretching between Florence and Siena, Chianti is made of a blend of sangiovese, trebbiano and canaiolo nero, although each blend is predominantly made up of sangiovese, if not entirely. This wine has different quality levels, ranging from basic Chianti, the cheapest of the bunch. The finest of them all is Chianti Classico, easily identified by a label with a cockerel motif on it, but this is also the most expensive example because it is considered one of Italy’s finest wines. The wildcard here is primitivo. One of the predominant grapes of Puglia in the south, this is a wine that can produce high alcohol levels (15% or more sometimes) because of the hot climate where it grows and its tendency to ripen unevenly. But these wines will have flavours of cherries, leather and liquorice with lots of fresh acidity. This could be a good wine to pour into your lasagne recipe given its strong flavours and aromas. If it is not available at your retailer, consider a dry zinfandel from California, since it is in fact genetically identical to primitivo. Spicy like barbera ought to be, fresh and full of classic plum and cherry flavours. Rich with the typical plums and cherries as well as a herbal aroma. Good acidity to cut through rich, fatty foods. This is a wine I’ve written about before and earns my approval for offering good value for money. Needs a few minutes of air to let the fruit flavours come alive. Savoury, full of plums but not overpowering,this is a bargain for Chianti Classico and can be found for less than £10 when on offer (recently at Co-op this was £9.99). This may be a better match for lasagne than barbera if you prefer your wines more restrained. Very affordable, rich, spicy, blackberries and cherries. Medium-bodied and likely a good candidate for pouring into a sauce or a cheeky drink before dinner.